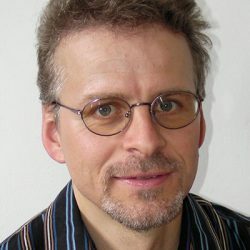 Marcus Hutter is Professor in the Research School of Computer Science (RSCS) at the Australian National University (ANU) in Canberra, Australia, and adjunct at the National ICT Australia (NICTA), which is Australia’s Information Communications Technology (ICT) Research Center of Excellence. He received his PhD and BSc in physics from the Ludwig Maximilian University in Munich and a Habilitation, MSc, and BSc in informatics from the Technical University of Munich. Since 2000, his research at the Swiss AI Lab, IDSIA (Istituto Dalle Molle di Studi sull’Intelligenza Artificiale) and ANU is centered around the information-theoretic foundations of inductive reasoning and reinforcement learning, which has resulted in 100+ publications and several awards. His book “Universal Artificial Intelligence” (Springer, EATCS, 2005) develops the first sound and complete theory of AI. He also runs the Human Knowledge Compression Contest (50,000 Euro H-prize). Intelligent systems have an increasing impact on our society. We already benefit from it particularly through our smart phones and experiences on the Internet. Self-driving cars and household robots could also be standard technologies very soon. Intelligent Systems approach and exceed human intellectual capabilities in an increasing number of domains (expert systems, board games such as Chess and Go, speech recognition and translation, process optimization, search engines), some can autonomously deal with unknown and unexpected situations. Indeed, Intelligent Systems have the potential to be deployed in almost any facet of our lives. The creation of super-intelligent systems will change our society in the next couple of decades more than the industrial revolution has in the last 200 years. It will have many & immense ethical, political, economical, medical, cultural, humanitarian, religious, in art, warfare, and other implications. For instance, it should change our attitude towards un(der)employment and ultimately the value of life itself.